Turkey could end crisis with the United States "instantly" by freeing the detained American pastor, President Donald Trump's national security adviser said, proving the White House's claims that the tariffs imposed by the U.S. on Turkish steel and aluminum being about national security interests are false. The Turkish currency has been targeted in a series of economic attacks since Washington ordered tariffs in retaliation for the arrest of Pastor Andrew Brunson on charges of espionage and links to the PKK and the Gülenist Terror Group (FETÖ) in the aftermath of the July 15, 2016 failed coup. Last week, White House Press secretary Sarah Sanders claimed that U.S. tariffs on Turkish steel and aluminum were "out of national security interests." "Look, the Turkish government made a big mistake in not releasing Pastor Brunson," U.S. National Security Adviser John Bolton told Reuters in an interview during a visit to Israel. "Every day that goes by that mistake continues, this crisis could be over instantly if they did the right thing as a NATO ally, part of the West, and release pastor Brunson without condition." 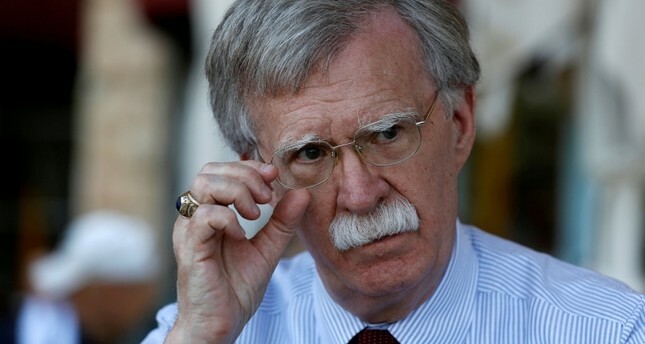 Asked if the United States questioned Turkey's membership in NATO given the stand-off, Bolton said: "That's not an issue at the moment. We're focused on Pastor Brunson and the other Americans that the Turkish government's holding illegitimately and we expect that to get resolved." Qatar's Emir this month approved a package of economic projects, including a $15 billion pledge of support, for Turkey, giving a boost to the lira. "Well, I think what they pledged is utterly insufficient to have an impact on Turkey's economy. It's certainly not helpful but we'll actually see what develops from their pledge," he said. Turkey and the U.S. have been locked in a heated crisis emanating from unjust sanctions and the actions of Trump, as Washington levied sanctions on Interior Minister Süleyman Soylu and Justice Minister Abdulhamit Gül for not releasing Brunson. Turkey responded in kind with similar sanctions to their U.S. counterparts, in addition to hiking tariffs for U.S. made alcohol, tobacco and automotive products. It also brought Trump's additional tariffs before the World Trade Organization. President Recep Tayyip Erdoğan also said last week that Turkey will impose a boycott against U.S. electronic products. Serving at the Diriliş (Resurrection) Protestant Church in the western province of İzmir, Brunson was arrested in October 2016 and moved to house arrest on July 25 due to health problems. He is scheduled to appear before a court in October for his third hearing after the court rejected several appeals for his release. The case of Brunson, a Christian pastor from North Carolina who has lived in Turkey for more than two decades, added more troubles to an ongoing and deepening rift between the two NATO allies over a number of issues including U.S. support for PKK terrorist group's Syrian offshoot People's Protection Units (YPG) and the extradition of FETÖ leader Fetullah Gülen, who resides in Pennsylvania in a self-imposed exile for the last two decades.